This sweet ditty of a paper cut film was created by animator Johnny Kelly for Adobe to highlight their latest Creative Suite software package. It follows the life cycle of an apple seed from conception and growth all the way to our bellies and back to the earth from which it came. We really like it because, like the best creative forms of expression, it is inspired by nature - the more inspired by our natural environment we are the more likely we'll feel connected to it, the more willing we'll be to find ways to preserve it. Innovative eco friendly ideas and design efficiency are often inspired by little ditti films like The Seed. 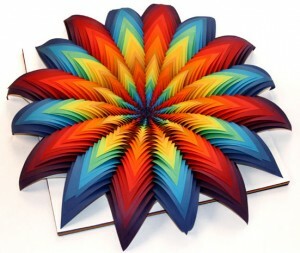 Another paper artist heavily influenced by the environment is Jen Stark. The young artist spent 100 days cutting 1 million scraps of paper to make a statement about the hyper commercialized art market. Her pieces are vivid reflections of flower-like images. Beautiful art inspired by a beautiful earth.